With an arch span of over 500 metres and a total length of over 1100 metres, Sydney Harbour Bridge is the world's largest steel arch bridge. The 49 metre wide deck also makes it the world's widest longspan bridge. There are eight vehicle lanes, two train lines, a footpath and a cycleway. Sydney Harbour Bridge occupies a commanding position in Sydney Cove and forms part of Sydney's world famous harbour skyline. 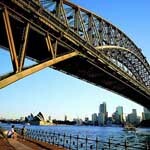 From the bridge, visitors enjoy excellent views of the Rocks, Circular Quay and Sydney Opera House. Even better views are available from high up on the steel arch. Making a bridge climb has become the latest tourist craze. Climb ? This hugely popular attraction is not only for adrenaline fans though, as anyone with moderate fitness levels will be able to experience sunrise or sunset from the very top of this 134 metre high landmark. Book through our tour partner here .